Gain knowledge and skills to become competent electrical wireman, thus opening avenues for employment in domestic wiring and also in support roles to industrial electrical contractors. Learn about various banking products and policies and acquire skills for selling these products to customers. Learn skills of configuring, installing, inspecting and commissioning solar rooftop modules that meet the performance needs of customers and the quality craftsmanship specified by the industry. Aligned to National Occupational Standards identified for Solar Rooftop Installer (SGJ/Q0101). Master skills and techniques for selling automobile products and managing customer experience. Aligned to industry standards specified for Automobile Sales Consultant (ASC/Q 1001). Get oriented to call center environment, fundamentals of customer service, telephone etiquette and sales technique. Gain skills and knowledge to efficiently and courteously serve food and beverage to guests at hotels, canteens and banquets. Aligned to Tourism & Hospitality Sector Council's industry standards identified for Steward staff (THC/Q 0301). Gain skills and knowledge to courteously manage guests and team members and effectively supervise implementation of housekeeping operations. Acquire knowledge and skills of retail operations and retail sales and services to become competent Sales Associates for any retail setup. Aligned to RASCI's(Retailers Association's Skill Council of India) role of a Retail Sales Associate (RAS /Q0104). 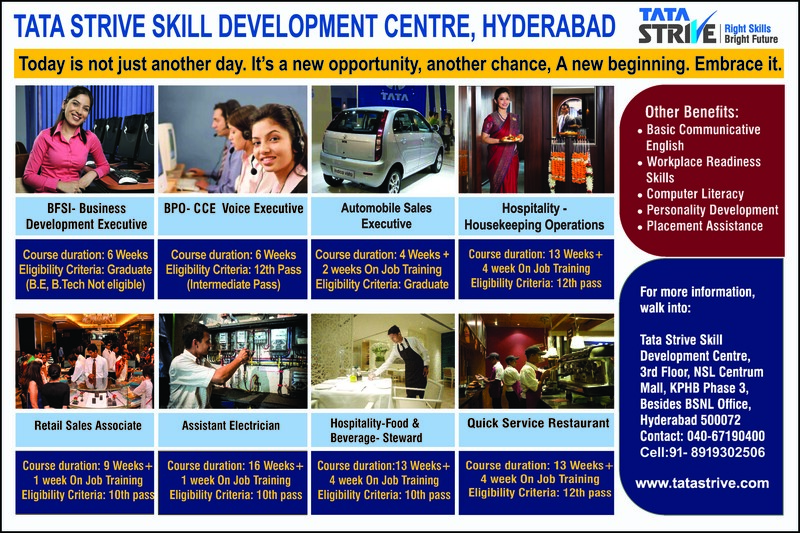 3rd Floor, NSL Centrum Mall, Beside BSNL Telephone Exchange, KPHB Colony, Phase –II, Kukatpally, Hyderabad, Telangana. Learn practical skills such as assessing vehicle performance issues as well as maintenance and repairing of vehicles. Aligned to industry standards specified for Auto Technician (ASC/ Q 1401). Master skills and techniques required to provide for patient the’s daily care, comfort, and safet. The course also equips the learner with skills in assisting a nurse in taking care of the patient’s health needsand help maintain a suitable environment. Master skills required to create customized Applications for Android platform that can be used by Smartphone or Tablets running on Android Operating System. Aligned to National Occupational Standards identified for Android app developers, TEL/Q2300. Aligned to National Occupational Standards identified for Assistant Beauty Therapist, BWS/Q0101. Carry out basic depilation services - waxing and threading services. Maintain a safe and hygienic environment at the work area.